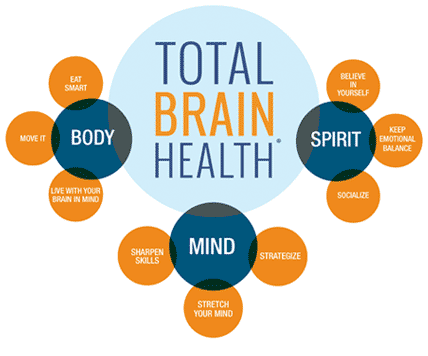 Body … because physical health is closely tied to brain function. Eating well, keeping fit, and practicing brain healthy habits are key for sharp thinking and brain vitality. Mind … because intellectual stimulation—through a variety of mentally stimulating activities that challenge different cognitive skills and routine thinking is essential for optimal brain health. Spirit … because emotional well-being, satisfying relationships, a positive outlook, and balancing stress are beneficial to brain health.